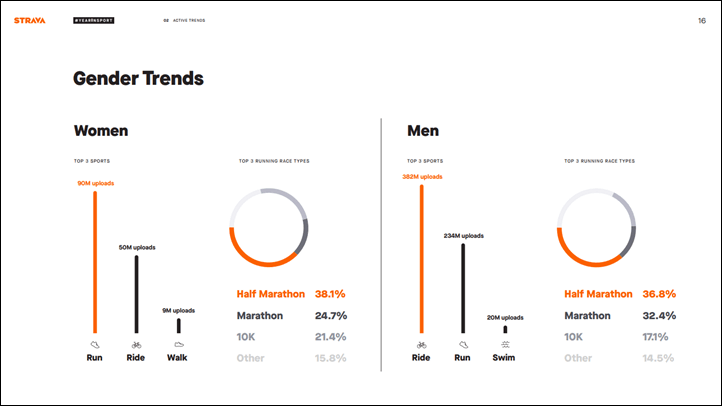 Strava’s 2018 Fascinating Year In Review Stats makes for interesting reading. The easiest gender stat to understand is that Strava is pretty male place. In one year there were 149 million total uploads by women and 636 million uploads by men. That means that 77% percent of the activity uploads were by men and just 23% by women. My fave stat in the report concerns preferred beverages. Cyclists drink more coffee and runners drink more beer. But everyone likes cake! Cake comes in third–just behind beer and coffee–as the food or beverage athletes prefer. I was thinking that ice cream would be up there. But that might be just me. In order, runners prefer beer, coffee, cake, cookie, donut, pastry. Cyclists like best coffee, beer, cake, cookie, donut, pastry. Where’s the data come from? It’s not as Strava connected devices track beer and donuts after all. Instead, these numbers are all self-reported. But all self-reported in a particular way. Strava got the numbers from the titles of individual workouts. (If you don’t give your workout a title, it gets the default of time of day + activity. Morning run or afternoon ride, for example. So really it means that runners are more likely than cyclists to put the word “beer” in the title of their workout. Ditto cyclists and “coffee.” Given how many “morning coffee rides” I’ve been on that’s no surprise. There might also be a gendered element. There are a lot of women running, and lots of them not on Strava. I suspect women runners would be less likely to give their run a beer-themed name. But I’m just speculating. This makes me realize that I’m not alone among women in not using Strava (or even having any interest). I always feel like I should, but then it feels like more work, effort I’d rather spend on the workout or on whatever cake or ice cream (I’m with you, Sam!) I’m planning to eat ex post. I love Strava for individual tracking on segments but there are times when that doesn’t feel good and then I don’t do it. This is a great post for me to use for my science and values class (first or second day),so they can see how data can conceal so many possible explanations. And I’ve also been on a zillion coffee rides and few beer rides. Beer also has a larger safety implication for cycling. I’ve seen running events where you run some distance, drink a beer and repeat several times. Since cycling is operating a vehicle, that’s really not a safe thing to be doing, at least not to that extent. I assumed they were drinking beer after cycling! Perhaps! Though drinking beer during an organized run seems to be a thing.